Against the backdrop of Dresden’s baroque and rococo architecture, the new Honda Civic Type R looks more than a little out of place. 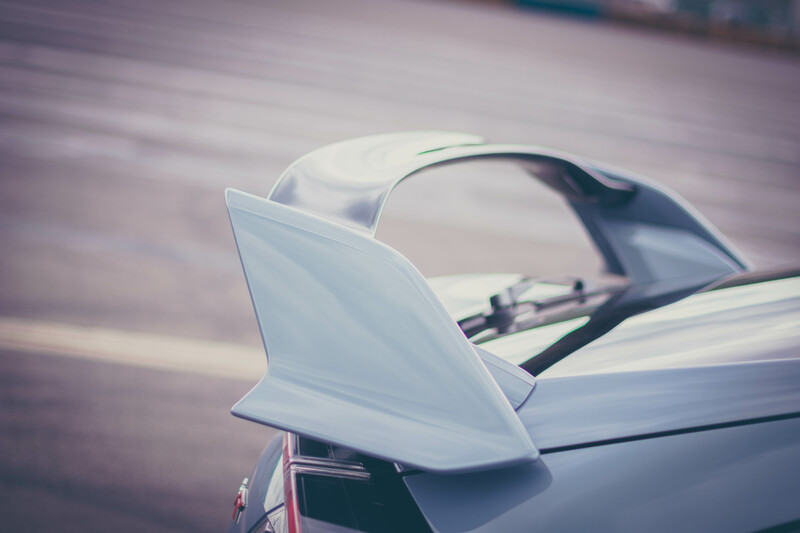 The multitude of sharp angles; the razor-edged front splitter; that huge rear wing. In fact, it’s not just the architecture that the FK8 Type R (that’s its internal moniker, by the way) clashes with. There is no other car currently in production that is so visually assaulting. We don’t necessarily mean that in a bad way though (even if the rear three-quarter angle has yet to grow on us). Cars should be fun, outlandish and divisive. 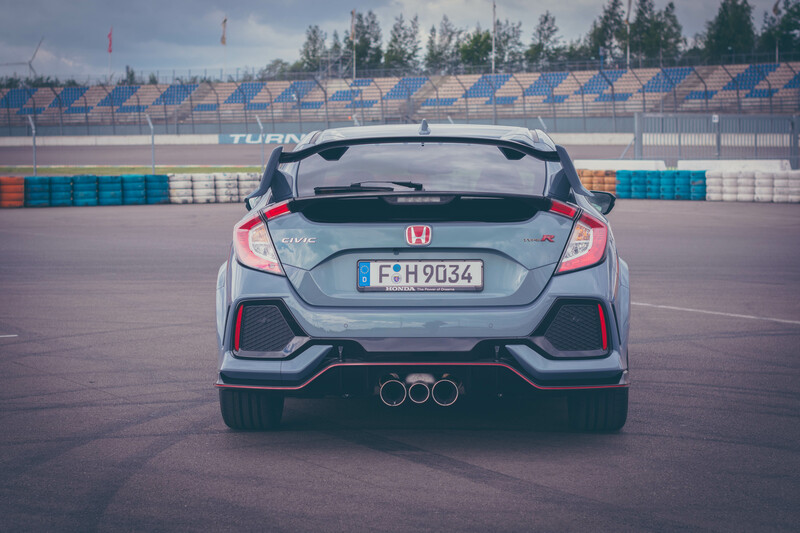 That’s why we adored the latest Civic’s predecessor – FK2 – so much. In the sports car world, you can buy a Porsche 911 GT3 RS and pretend you drive a racing car on the road. That wasn’t possible in the hot hatch world until Honda’s design department went completely mental in circa 2015. They haven’t let up with the levels of ludicrousness on the 2017 Civic Type R either. This is a five-seat family hatchback that can hit 169mph at full tilt and 0-62mph takes just 5.8 seconds, despite all 320hp being sent to the front wheels. Yet, when it wants to be, the new Type R can be genuinely reserved. It may look at odds with Dresden’s stylings but over the city’s numerous cobbled streets it doesn’t feel out of place. In fact, switching the new three-way drive mode into ‘Comfort’ gives the adaptive suspension system a suppleness that evaded the FK2 entirely. 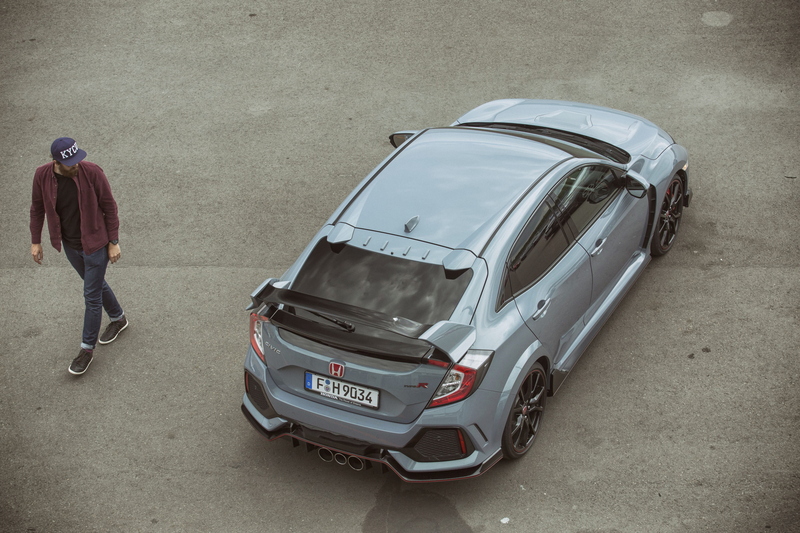 Where the old car would crash into bumps with overwhelming intent, the latest Civic Type R is gliding over the rutted surface like an ordinary family cruiser. If it weren’t for the swathes of Alcantara, red flashes and carbon trim, you wouldn’t think you were driving along in something that looked like a genuine, race-bred touring car. Don’t change channel just yet though. The Honda Civic Type R hasn’t gone soft. Well, in ‘Comfort’ mode it has, but in ‘Sport’ and ‘+R’ it’s just as much of a rabid dog as ever. 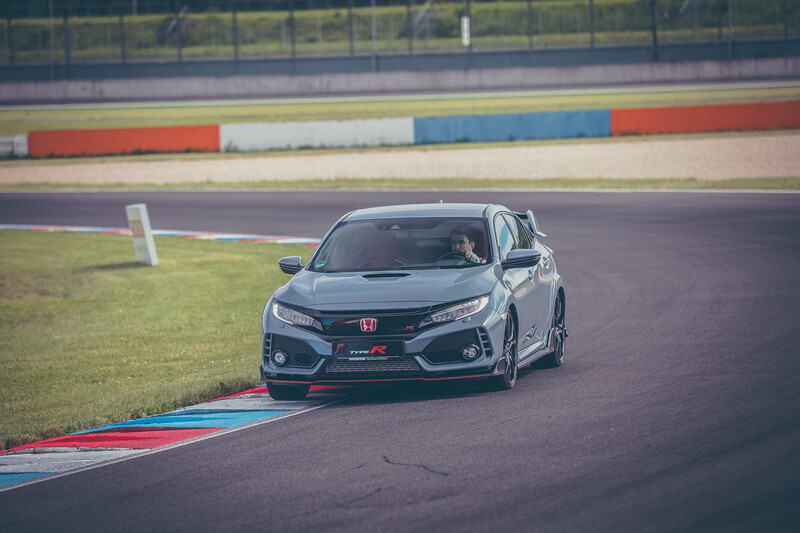 Out of Dresden, it doesn’t take long for us to get a taste of the updated 2.0-litre VTEC turbo engine, pulling out onto an unrestricted section of autobahn – you can’t help but love the Fatherland – on our way to EuroSpeedway Lausitzring. With a lighter, single mass flywheel, the turbocharged Type R’s throttle response is sharper than ever. This is without a doubt one of the finest forced induction engines of all time. 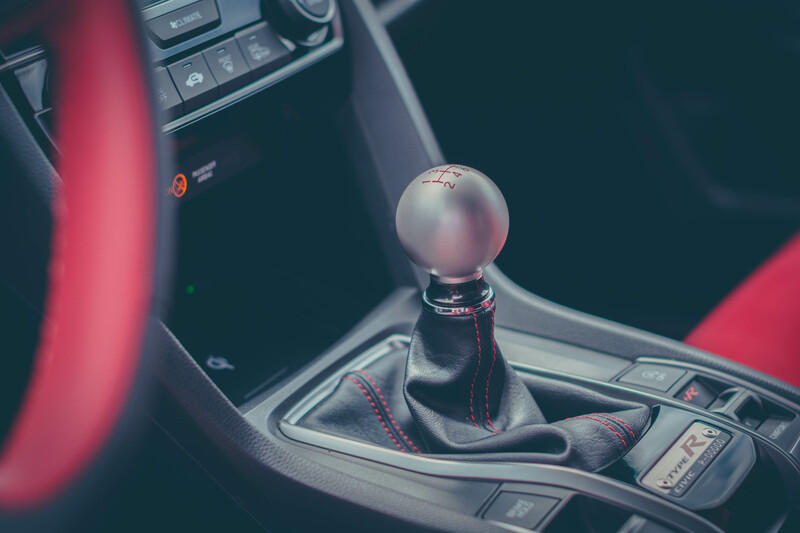 And it’s mated to the still-superb six-speed manual ‘box that starred in the FK2 generation car. 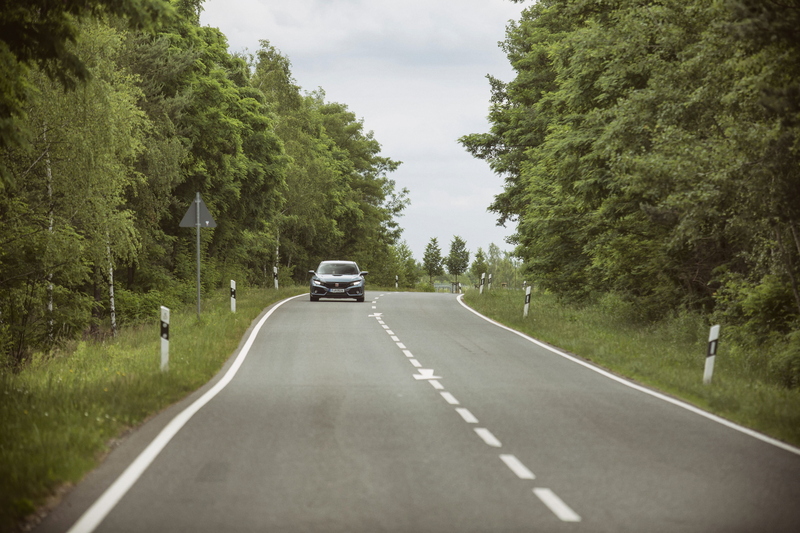 The difference is, the 2017 Civic gets even shorter gear ratios, allowing you to enjoy the motor’s free-revving nature and slick shifting with even greater abandon. With trucks firmly in the left lane, it doesn’t take long for the Type R to rack up the tonne and, keeping our foot in for as long as we dare, we just top 160mph before one of the morning juggernauts halts our terminal velocity attempt. However, it’s not just the face-warping speed that impresses on the autobahn. 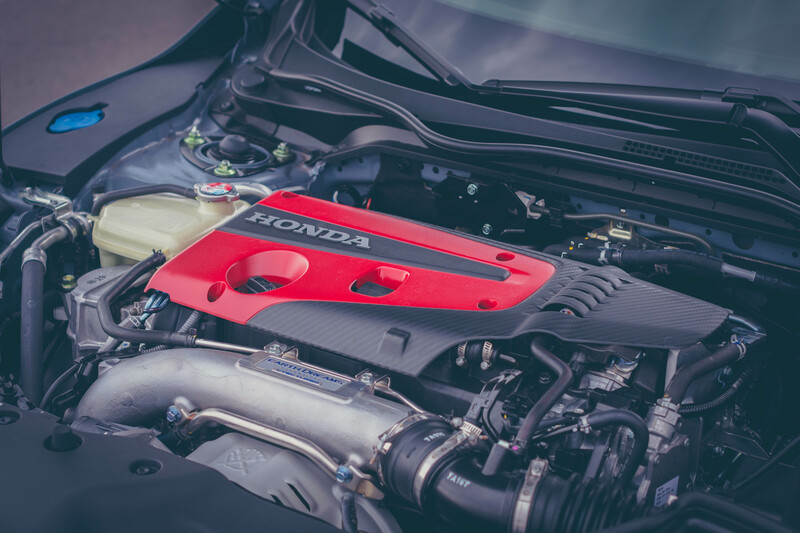 Compared to the standard Civic SI (which, in 1.5-litre form, we go up to 137mph the night before) the Type R is in another league when it comes to stability. 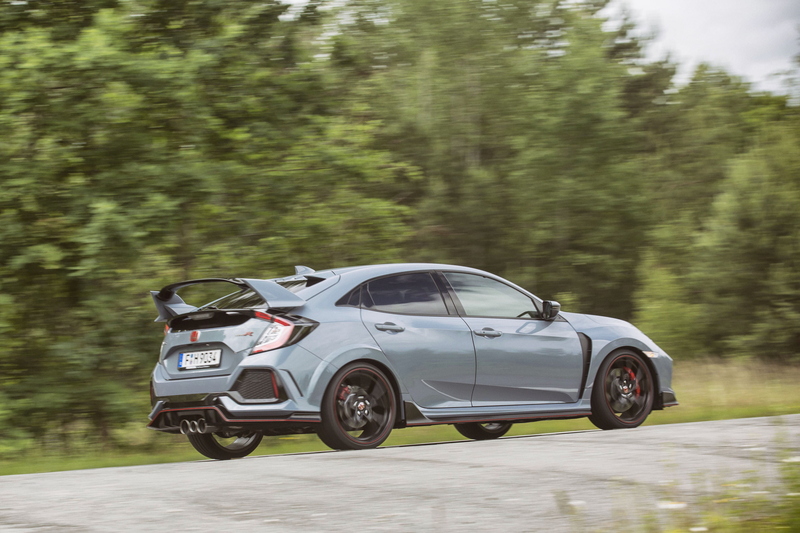 You’re probably thinking, “Well, duh, look at it!” But, the thing is, most hot hatches – despite all their aero addenda – don’t actually produce genuine downforce; they just limit the level of lift. 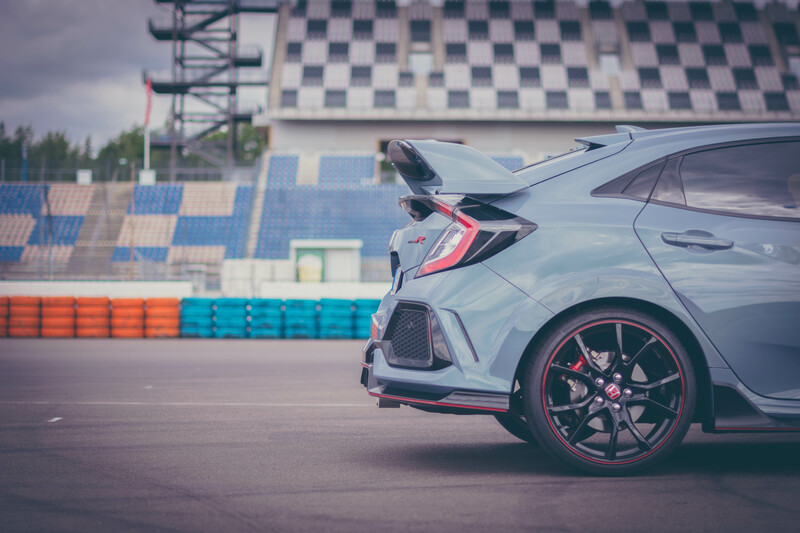 Not so with the 2017 Civic Type R. Picking the brains of their World Touring Car Championship team, Honda has taken the lessons learned on the racetrack and transferred them to its latest hyper hatch. That means boxy, flared front arches, vortex generators on the back edge of the roof, and all new side skirts. Oh, and that rear wing (which, thanks to some aero wizardry, has been thinned out to reduce drag, while maintaining the same level of downforce). It all adds up to a car that just wants to go faster and faster, and feels all the better for it. Where the SI began to start floating at high speed (not that we ever expect one to see 137mph again), the laws of physics simply glue the Type R to the tarmac. Those ridiculously aggressive aero flicks and creases aren’t just designed to help you smash down the autobahn though. 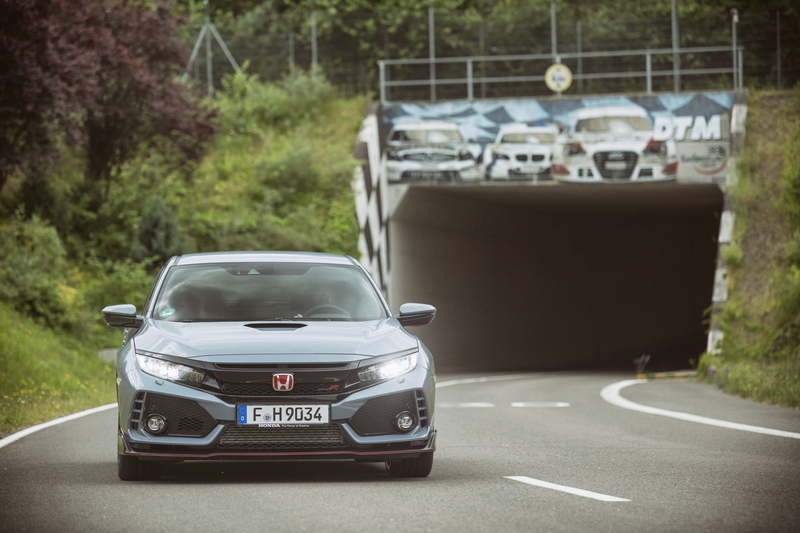 On track, they turn the new Civic Type R into an absolute weapon. It’s not hard to see how this thing is now the fastest front-wheel drive car to ever lap the infamous Nürburgring Nordschleife. Shoving the car into ‘+R’ mode, you can feel the whole chassis stiffen up, almost in nervous anticipation of what lies ahead. The steering suddenly has some genuine weight behind it (in the other two modes it’s slightly too light to add any real feel) and – thanks to a variable ratio steering rack – the response from the front end is, in a word, immense. 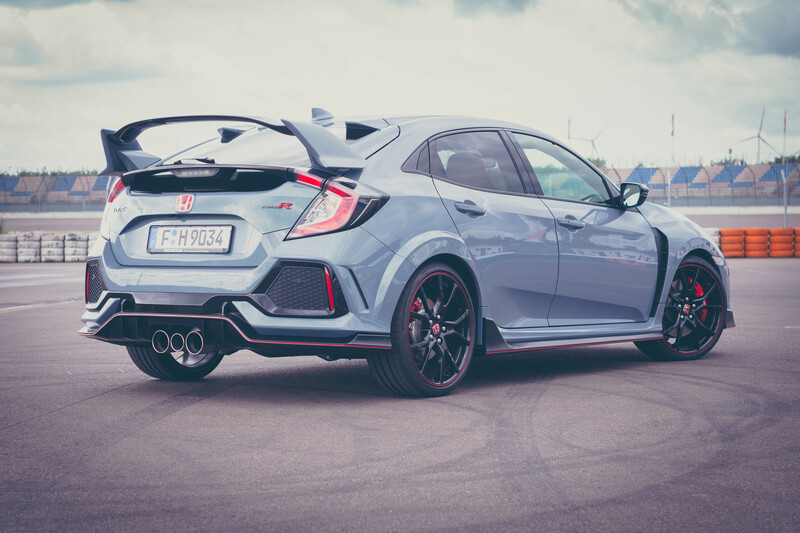 Despite appearances, and its ferocious appetite for devouring track-based tarmac, the Type R isn’t actually as intimidating to drive fast [very fast – ED] as you would think. In fact, thanks to an increase in its wheelbase of 95mm, the car’s high speed stability and composure under braking mean you can really throw it around in the corners in ways that would unsettle most FWD competition. Out of the slower corners, traction does sometimes become an issue but the mechanical limited slip diff and clever torque vectoring tech does a great job of slingshotting you down the next straight. If you thought FK2 was impressive on track, FK8 rewrites the rulebook. There’s also a new rev-match system to help smooth out your downshifts, allowing you to focus on hitting the perfect apex point lap after lap after lap. Don’t worry, more experienced track day warriors can switch it off via the central infotainment screen. 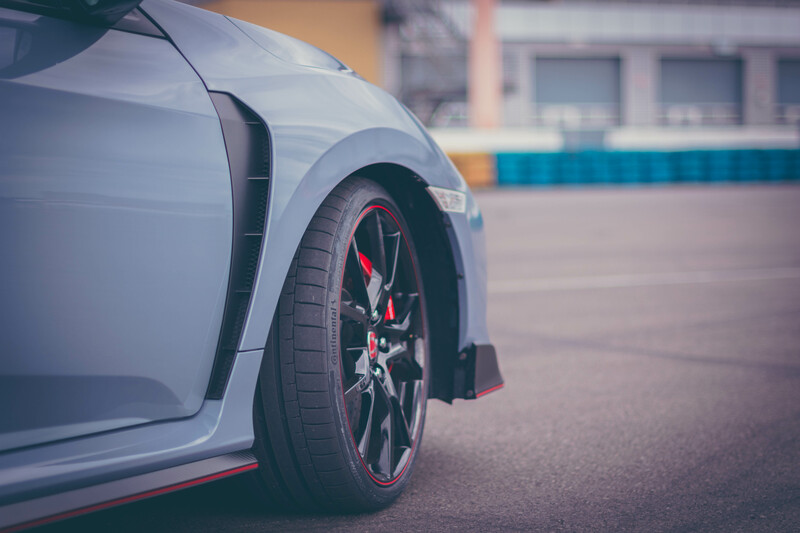 The Type R’s huge Brembo brakes feel even better than on the FK2 too, with a harder pedal and hardly any fading as the heat builds up thanks to new cooling ducts inside the front arches. It all adds up to a track car that doesn’t just look like the FWD equivalent of a 911 GT3 RS, it drives like one too. Strip one right out and you’d probably have a pretty decent racer without having to do any tuning work yourself. It’s that good. Being a circuit master doesn’t necessarily mean a car’s dynamic talents translate to the real world. After all, you shouldn’t usually tackle corners at 100mph on the open road. The FK2 Type R sometimes struggled to shine on usual hot hatch stomping grounds thanks to an overwhelming desire to go exceedingly fast. At legal speeds, the old car’s engine and chassis just weren’t able to shine through thanks to an abundance of grip. While the 2017 model is better, there is still a similar issue with Honda’s FK8 Type R. The chassis – complete with re-designed multi-link rear suspension – is just too good, especially when in ‘Sport’ or ‘+R’ modes. 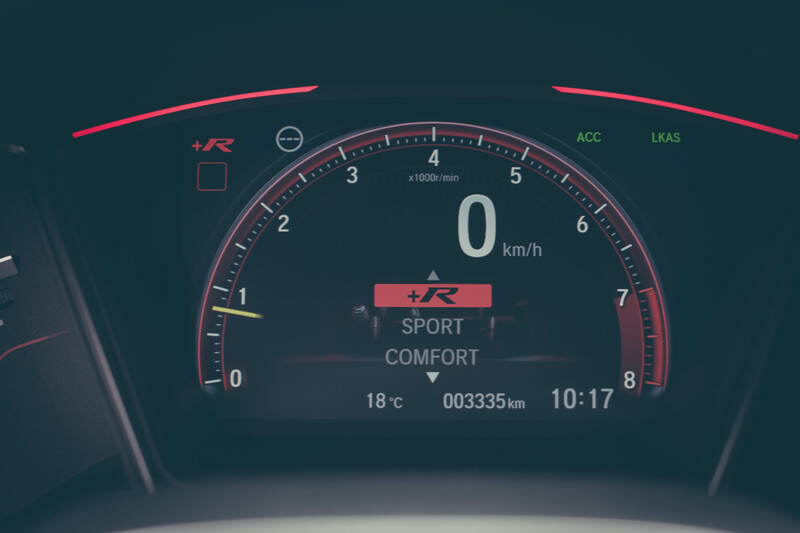 Thankfully, the addition of the softer ‘Comfort’ damper setting can add a bit more pitch and roll into the real world experience, allowing you to feel the car dance around at speeds that won’t be risking your licence. It’s a bit of a shame though that Honda didn’t add an ‘Individual’ drive mode like some manufacturers as, in an ideal world, it would be great to cherry pick the different dynamic parameters to suit your favourite back road blast. Despite this, the new Type R is definitely more entertaining on open roads and, with those shorter gear ratios, you can take the engine all the way to the 7,000rpm redline in second and third before you have to start worrying about PC Plod. This allows you to regularly enjoy the VTEC Turbo’s much improved soundtrack, courtesy of the new triple tailpipe exhaust system, as well. Where the FK2 sometimes sounded a little, erm, agricultural when revved really hard, the new Type R is a much more polished sonic proposition. There’s a little more bass through the mid-range before the top end is met with a wonderfully touring car-esque howl. What’s more, that middle pipe actually helps to reduce the booming noise when cruising. And it looks cool. So a big win-win, really. £30,995 may seem like a lot to pay for a front-wheel drive hot hatch, especially when some of the similarly priced competition is packing supposedly superior four-wheel drive systems. 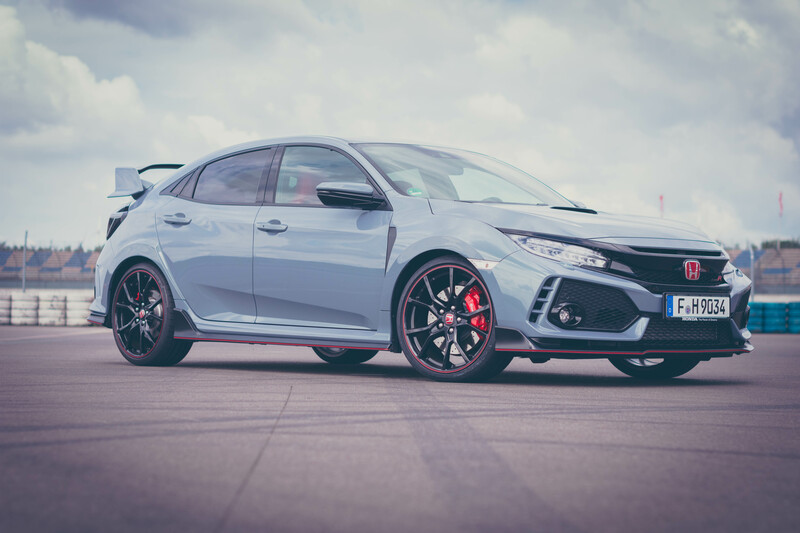 However, as an exercise in outright driving dynamism, the new Honda Civic Type R runs rings around the VW Golf R (even if its ludicrous looks may not win over those looking for a reserved family runabout). 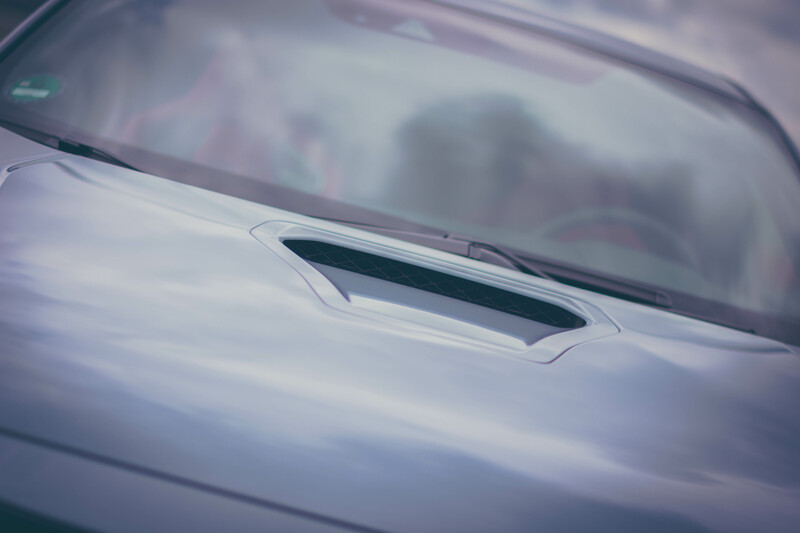 Honda has also realised that to compete with the likes of Volkswagen it needed to improve the interior fit and finish of the Civic, something it has done with genuine style. 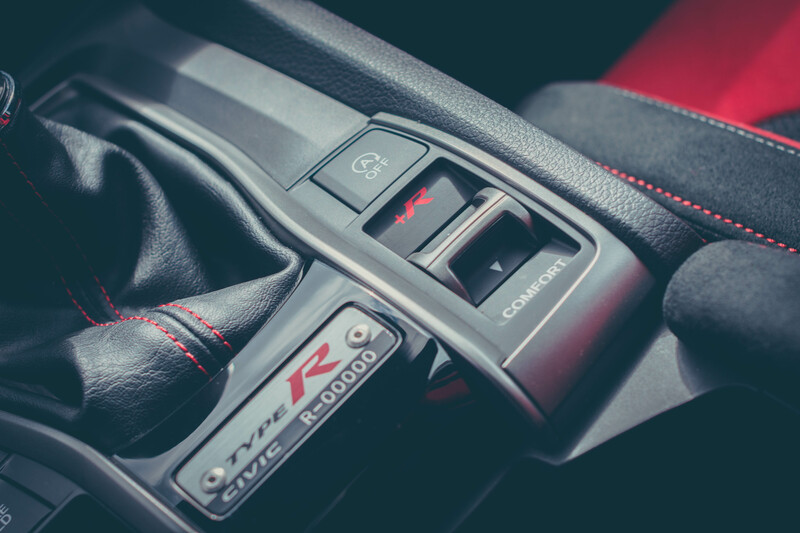 While not quite as space age as the FK2’s cabin design, the new Type R’s interior is a genuinely pleasant place to spend a huge number of miles. The revised sports seats look incredible and hold you tight in all the right places, while the LCD dashboard is packed with just the right amount of information. 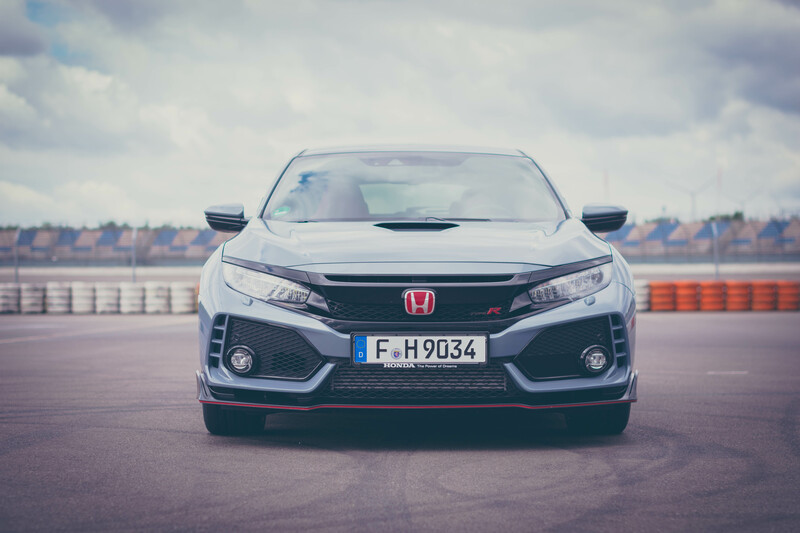 It may look like the lunatic’s choice but the reality is the 2017 Honda Civic Type R is actually a very sensible proposition if you’re after the best hot hatch around. Dr Jeckyll has managed to tame Mr Hyde.